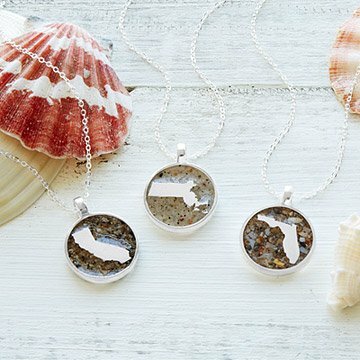 Show your state spirit with this custom coastal necklace. Whether sunset beach strolls are a nightly ritual or you're missing a beloved vacation spot, this custom necklace holds your treasured coastline close. Each sterling silver necklace is handcrafted with a charm featuring your state surrounded by a pinch of sand set in resin. Holly Daniels Christensen, a Cape Cod native, keeps sand from thousands of shores in her studio, but you can also customize your design by sending your own collected granules. Handmade in Massachusetts. In response to our customers' requests, we are happy to offer you the option to send in your own sand for a more personalized belt bracelet. If you choose this option, you will be sent a convenient mailer with instructions. Make it a set with the matching bangle. You can polish your necklace with a silver polishing cloth then use a soft cloth or brush with soap and warm water to remove the polishing residue. If the "sandy" part of your necklace becomes scratched or cloudy, buff with car or boat wax. What a wonderful, meaningful memento! My wife absolutely loves going to Paris, and she recognized the map immediately. It is classy, unique, and perfect.